Enjoy al fresco parties and other gatherings under the shade of this large, octagonal canopy gazebo tent. Featuring a durable polyethylene cover, this spacious tent delivers 90-percent UV-protection, providing essential shelter from the sun. NOTE: Outsunny advises customers NEVER to leave the tent up in windy and/or otherwise bad weather conditions. 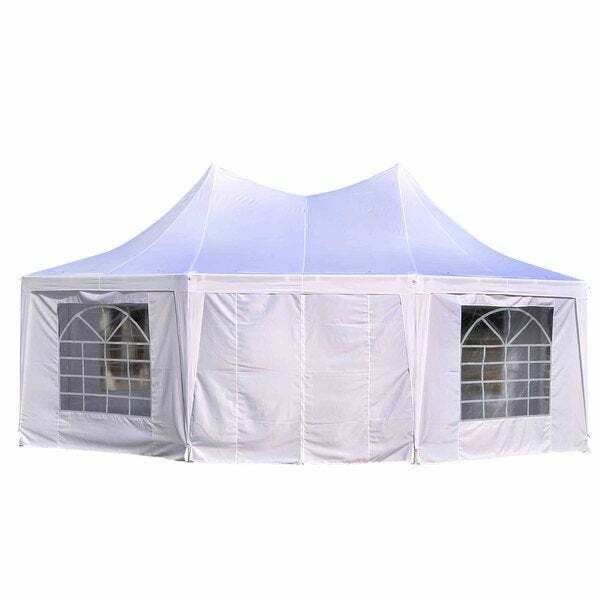 This tent is meant for sun shade purposes and not for winter / rainy weather conditions. Outsunny is not responsible for damage due to these conditions. It is ultimately up to the customer to determine if the assembly and anchoring of this canopy is sufficient. Dimensions 22' 3" x 16' 4"